What do we tell our children when education didn’t matter? When compliance, age, or evidence didn’t matter? When guilt or innocence didn’t matter? When our outrage didn’t matter? The building on which the mural lived was demolished shortly after its painting. But, like Castile, the mural lives on in memories of the community. 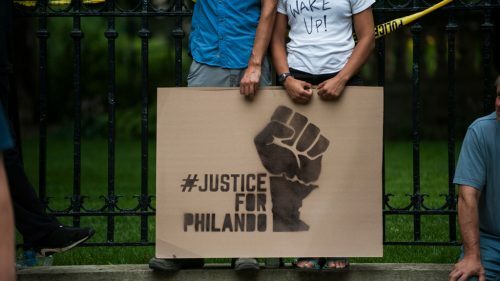 Philando Castile was shot and killed by Officer Jeronimo Yanez on July 6, 2016. A year later, Officer Yanez was acquitted of second-degree manslaughter and two counts of dangerous discharge of a firearm. Afterwards, the video footage that the ACLU of Minnesota fought to get released was finally made public. In the video, you see Castile shot unnecessarily by the frantic police officer in front of his girlfriend and her 4-year-old daughter. Two years later, there is nothing reassuring to tell the hundreds of children at J.J. Hill Montessori Magnet School, where Castile worked for more than a decade. There was no reason for his killing. But Castile is not the only person that Minnesota community members have had to grieve for in the two years since his killing. Last July, Justine Ruszczyk Damond was shot and killed by Minneapolis Police Officer Mohammed Noor after she called the police to report a possible sexual assault occurring near her home. Gilbert Salas was killed by St. James Police in February of this year. And, just last week, Thurman Blevins was shot by the police in North Minneapolis. Families, friends, neighbors, and loved ones should not have to continually brace themselves for the next police shooting. Minnesota residents should not have to march in the streets demanding justice, only to have another member of their community shot. For Minnesota to address the problem of how police use excessive and deadly force, we need to enact large-scale reforms across the state. To start, that means reforming the state law on body cameras. The legislature needs to mandate that all footage of such uses of force is made public as well as to establish minimum standards for body camera deployment by police departments, including mandatory activation, discipline for violating policy, compliance audits, and prohibiting officer review of footage prior to writing initial reports. The police should not be allowed to hide behind a “criminal investigative data” classification to delay the release of video and audio in police incidents. This type of stonewalling is what is currently preventing us from accessing video and audio of the shooting of Thurman Blevins. We also need to facilitate investigations and, where appropriate, discipline officers who use excessive force. First, the Minnesota Board of Peace Officer Standards and Training, which is responsible for dispensing occupational licenses to law enforcement, should be empowered to act like every other professional licensing board and conduct its own separate investigations and make its own decisions about actions against an officer’s license. The legislature also needs to create an independent state agency responsible for investigating and prosecuting police officers who engage in excessive force and other police misconduct. Finally, Minnesota municipalities need to give civilian review boards the authority to investigate and discipline officers who abuse their authority. But even these reforms may not be sufficient. For example, even when there is footage of police misconduct, like in Castile’s case, it has not led to a conviction of an officer or the revoking of their license. Above all, what we need to do is fundamentally transform the system and change the laws by which we judge police conduct. Existing legal precedents fail to deter officer misconduct, and it is time for courts to re-examine them. Under the Fourth Amendment, an officer’s subjective reason for pulling somebody over is irrelevant. As long as the officer has any probable cause for the stop, the courts will find the officer is in compliance with the Fourth Amendment. Racial profiling violates the 14th Amendment, but it requires proof of intentional discrimination — something that is very difficult to prove. So young African-American men like Castile get pulled over time and time again for minor offenses with little or no recourse for the officers who racially profile them. The Fourth Amendment prohibits “unreasonable searches and seizures” and an officer’s record of disproportionate stops of people of color should be part of the equation when courts consider whether a particular stop was reasonable. And courts looking at excessive force claims often give police every benefit of the doubt. In fact, two recent U.S. Supreme Court decisions, Kisela v. Hughes and County of Los Angeles v. Mendez, give police wide latitude to shoot people, making it even harder to hold police officers accountable in our judicial system. If Minnesota police continue to refuse to hold officers accountable when they use excessive and deadly force, then we will have to re-evaluate the power and tools that we give to the police and fund alternatives to policing, such as mental health first-responders, restorative justice initiatives, and community-based programs that do not require an armed police response. As the system stands now, so clearly stacked against victims of police violence, that may be our only choice. Previous : Will the Council Change Public Comment Policy?